Omega Woman is an evening primrose oil supplement with 500 mg of omega-3 from fish oil to support a woman's unique hormonal needs and promote healthy skin. Evening primrose (Oenothera biennis) is a wildflower native to North America. Its seeds contains a high concentration of the functionally necessary fatty acid gamma-linolenic acid (GLA). 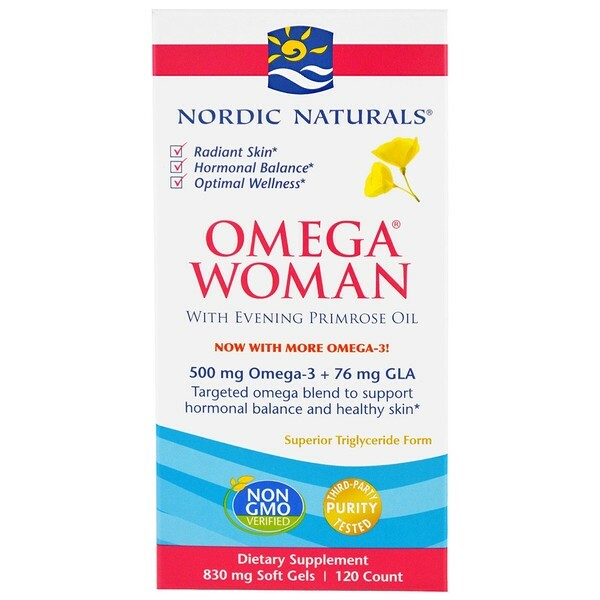 Every batch of Nordic Naturals fish oils is tested by a third-party certified for lab for environmental toxins, including heavy metals. 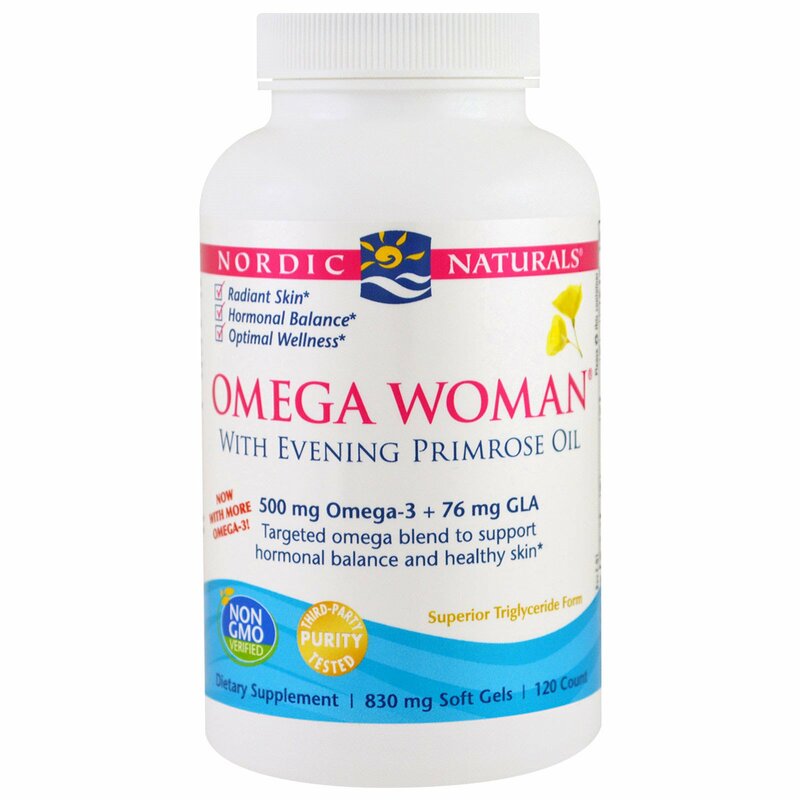 All fish oils are triglyceride for and surpass the strictest international standards for purity and freshness. Certificates of Analysis available upon request. Natural source of GLA (gamma-linolenic acid). Triglyceride form for 70% better absorption. Exceptionally fresh fish oil encapsulated in a lemon-flavored soft gel. 100% wild-caught fish, sourced from sustainable fisheries. Tested by independent labs to surpass the strictest international standards. Free of anything artificial or genetically modified. 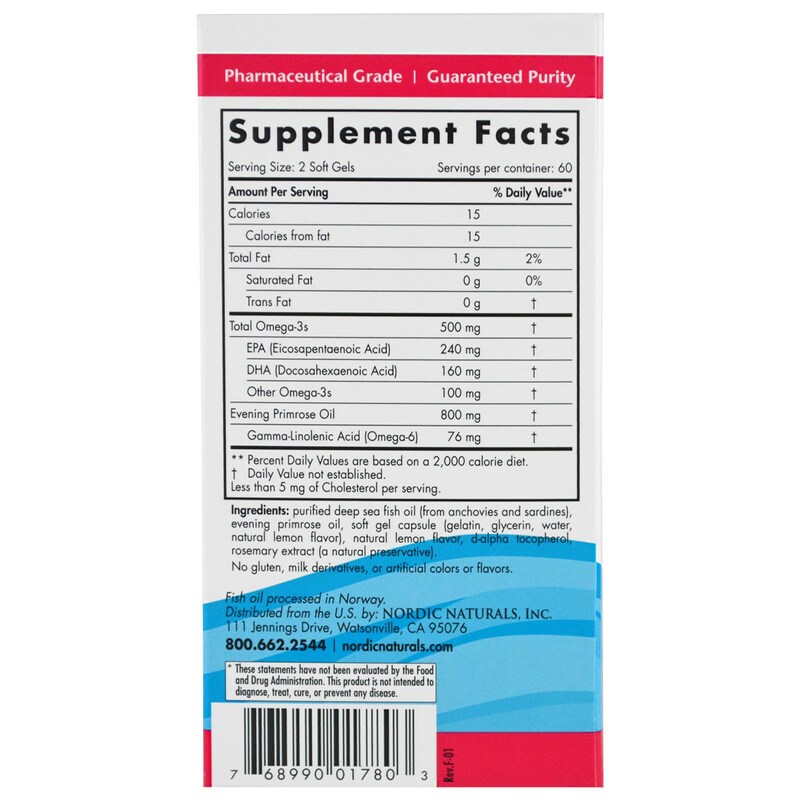 Purified deep sea fish oil (from anchovies and sardines), evening primrose oil, soft gel capsule (gelatin, glycerin, water, natural lemon flavor), natural lemon flavor, d-alpha tocopherol, rosemary extract (a natural preservative). Consult with your physician before using this product if you are pregnant or lactating, are allergic to iodine, use blood thinners, or anticipate surgery.